Two exhibitions featuring local artists are set to open in downtown Long Beach this month, thanks to the support of the Downtown Long Beach Associates (DLBA) and MADE in Long Beach. The DLBA’s second annual Talent Pool competition, where artists can submit their work for a chance to be included in a year-long showcase in the organization’s offices, as well as receive an honorarium per piece, has led to the creation of the Deep End of the Pool, an exhibition at MADE in Long Beach. Talent Pool 2016’s winning artists were selected by a group of jurors, including Executive Director of the Long Beach Art Museum Ron Nelson, Exhibition Curator at the Museum of Latin American Art Edward Hayes, University Art Museum Director Brian Trimble, President of InterTrend Communications Julia Huang and POW! WOW! Long Beach Director John Hall. Out of 45 applicants, the artists selected were Ginny Barrett, Jennifer Celio, Kimberly Davis, Brian Kinnaman, Olga Lah, Connie DK Lane, Christine Nguyen, Gregory Dane Sabin, Katie Stubblefield, Dave Van Patten, Renee Tanner and Tracey Weiss. Deep End of the Pool is an expansion of the DLBA’s Talent Pool 2016 into the MADE in Long Beach gallery, featuring installations from local artists including Jennifer Celio, Olga Lah, Christine Nguyen, Jorge Mujica, Gregory Dane Sabin and Dave Van Patten, a few of who have studios set up at MADE, as well. Two receptions for the artists will be held for the public to attend. 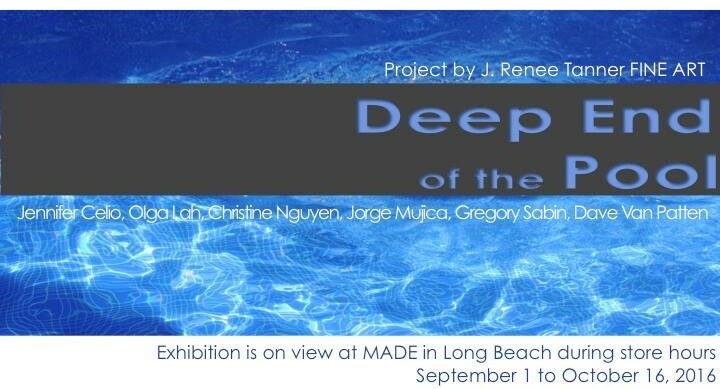 On Saturday, September 17 MADE in Long Beach will host the celebratory event for Deep End of the Pool from 4:00PM to 7:00PM. On Friday, September 30 at 4:00PM, the DLBA will host a preview of Talent Pool 2016, followed by a walk to MADE in Long Beach where a presentation will take place at 6:00PM. Outside of the receptions, the Talent Pool 2016 exhibition can be viewed at the DLBA Offices Monday through Friday from 10:00AM to 4:00PM and Deep End of the Pool Monday through Thursday from 10:00AM to 6:00PM, Fridays and Saturdays from 10:00AM to 7:00PM and Sundays from noon to 6:00PM.